This ain’t no high-falutin’ showdown for the sappy. This here is the real deal, rootin’ tootin’, disc shootin’ that’ll make an armadillo curl up and high-tail it home. ‘Round here, yer either the best shot or you’ll be buzzard food. 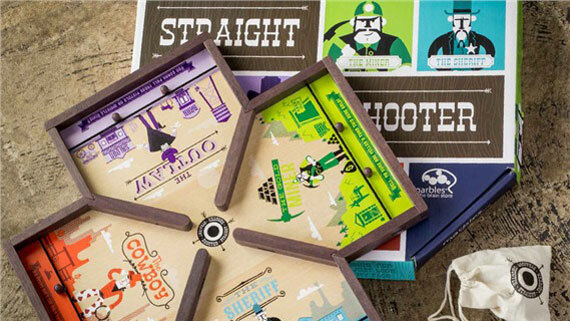 Not only are ya shootin’ for braggin’ rights, but straight shooter helps with the way yer hands and eyes coordinate. An’ don’t even git me started on the benefits to yer visual perception. Which helps fer when yer ridin’ around town on horseback andother such activities. The game itself is constructed on geen-u-wine wood. Much finer than Ol’ Man Jones’ wooden leg. If that don’t make ya skip fer joy, then maybe ya been in the sun too long. 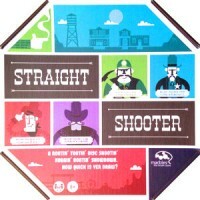 Add a Review for "Straight Shooter"